Baking cakes with whole wheat flour has it's own advantages. You get nutty flavors even without using any nuts so it can be great for someone with nut allergies. Also, I have always been endorsing recipes that are affordable for all, that is when they don't use too expensive ingredients and are easy to cook or bake. Cost of the ingredients is a relative factor as we all find our spending limits variable, like I would spend on nuts, fresh fruits and vegetables more than my own limits sometimes but wont ever buy a jar of blueberry jam that costs me 250 bucks. The reason is, I look for value for money when it comes to nutrient availability, taste and texture if I am shopping for food ingredients. I also care to reduce my carbon footprint so rarely use any imported stuff. But honestly, when I bake something in my kitchen, only two factors are on my mind. The final taste of the bake and how uncomplicated it would be to whip up. Time management is a major issue with me and I know it is for many of you as well, so the affordability of a recipe has more concern towards time taken and expertise required. I am sharing an easy recipe yet again. This cake would use apples from Himachal or Kashmir or any apples you find locally. We all stock spices and honey so there will be no exotic ingredients to be sourced. I keep getting complements on how I post recipes with readily available ingredients but I would tell you honestly, this happens because I believe in using local ingredients more and more. First powder the sugar with the spices so it makes spiced sugar. Keep aside. Mix the whole wheat flour with salt, baking soda and baking powder and keep aside. In a deep mixing bowl, whip the eggs with the oil and honey first. Add the grated carrots and then the sugar and whip. Add the flour mix and fold gently. 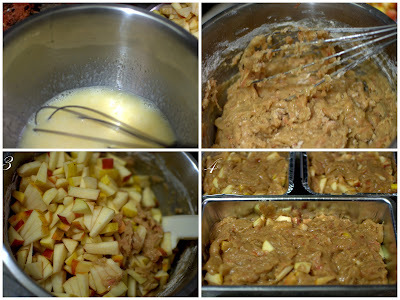 Add the chopped apple bits and fold them all in the thick batter. The batter is quite thick like muffin batter, so you can bake muffins with this as well. 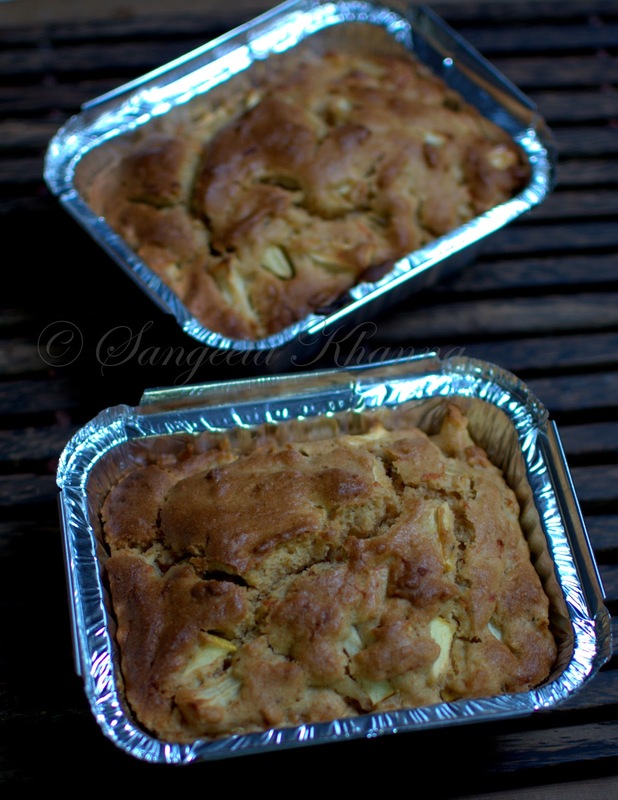 Scoop the batter into greased and dusted loaf tins and bake in preheated oven at 160-180 C for 45-50 minutes. I baked one regular loaf and two small loaves (in the foil trays) and noticed that the foil ones baked earlier than the aluminium loaf tin, so took out the foil trays first and baked the loaf tin for further 10 minutes.Watch the baking after 40 minutes and decide accordingly. 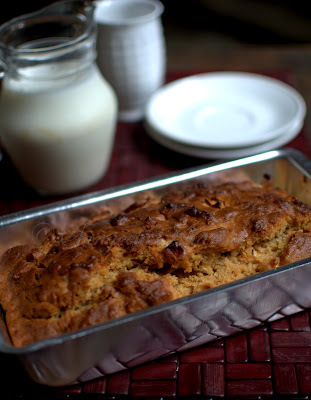 This cake tastes great while still warm, but since it is a spiced cake, it certainly ages well. Tastes much better after 2-3 days and even after a eek of baking. If it lasts that long. As I discussed in the beginning of this post, whole wheat imparts a rich nutty flavor to a cake, especially if you allow the crust to brown a little. But take care not to brown the crust too much as it gets light brown to dark brown very quickly. I have burnt many of my crackers when a call came when I was baking or when I got stuck to my monitor for a minute. A burnt aroma you wont enjoy in a whole wheat cake as you do in a smoky barbecued meat. So take care not to let the crust get too brown. This cake is nutty without the nuts as I said, rich and dense being whole wheat but very soft and redolent with flavors of ginger and honey. 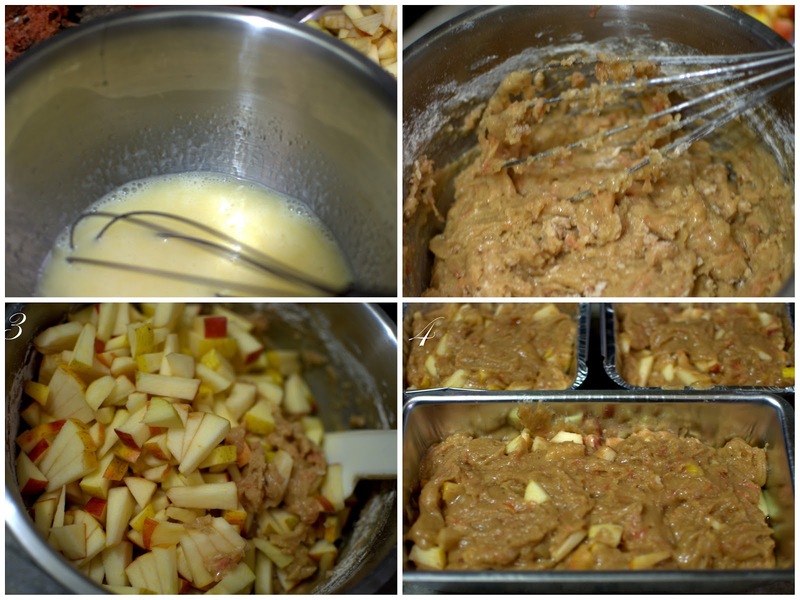 Apple flavors are not that apparent on the palate, just a fruity hint but it imparts the much needed softness to the cake. Grated carrots are used to make the cake moist, you can use another grated apple if you don't want carrots in it. The small loaves that I gave away. Got huge complements about the taste and how the cake tastes so rich. I gifted these ones after a day of baking it so it tastes better, I knew it wont last till the next day once cut. This cake is better after a bit of ageing. 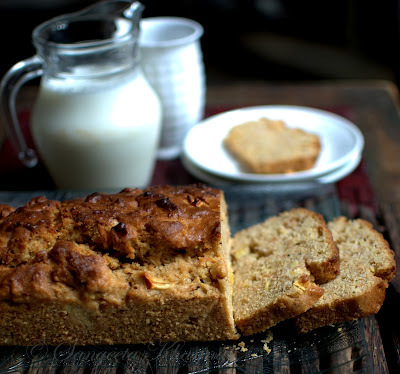 Spices and ginger make this cake really Christmas flavor. Winters are anyways spice and ginger flavored for me, so this cake is rich with all one needs in this season. In small doses though. How healthy is your Christmas cake? You can use thick yogurt instead of eggs Mona, along with 2 pinches of soda bi carb added. 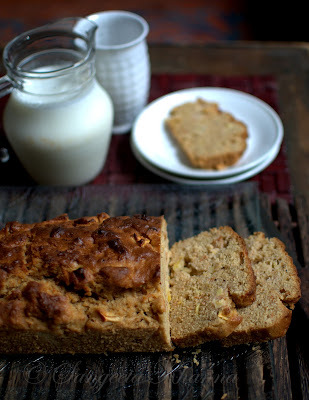 I haven't yet tried this cake without eggs so the result may be a little different. Sangeeta, when you say 'cup,' what is the measurement of that cup? Susan, I use the standard measuring cups, each cup is 236 ml. You can use any bowl that measures this much. Can I use butter in the place of olive oil? 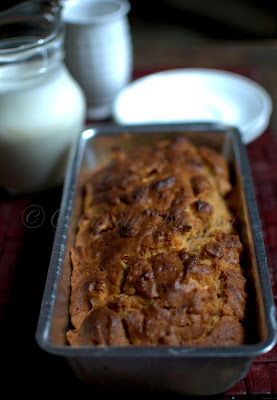 Yes you can always bake this cake with butter too Lakshmy.